Here at WineClubReviews we’re already saying #YesWayRosé and salivating over this summer’s best rosé deals. Truth be told, we don’t actually wait for summer to drink #RoséAllDay, but since that’s the most popular time of year to #DrinkPink, that’s when the best offers surface. Check out Rosé 101 if you need some background on why Rosé wine is so hot. What is Ninety Plus Cellars? If you’re not already familiar with Ninety Plus Cellars (Ninety+), let me break it down for you. Through various means, Ninety+ brings wine to market they believe that could rank 90 points or higher if critically-reviewed. Sometimes they purchase grapes that haven’t yet been harvested and make their own wines, sometimes they buy wine that’s already been produced but needs to be bottled, and every once in a while they’ll buy wine that’s already bottled but just needs a label and a winery to sell it. This method of acquiring great quality wine and selling it under their own label allows them to keep their prices low — wines that would normally sell for much higher prices. This is (roughly) the same business model in use by Cameron Hughes and Kirkland wines at Costco. Deliveries of the Rosé Summer Wine Club will arrive in May, June, July, and August. You can choose between three bottles for $50 per shipment or six bottles for $90 per shipment (shipping is included in the monthly price). Want more than just rosé for a steal? Ninety Plus Cellars also offers a quarterly wine club subscription featuring 3, 6, or 12 bottles of their exceptional selections. We haven't yet published our formal review, but we think highly of Ninety Plus Cellars. VineBox is a unique wine club which selects premium wines each month and then rebottles them into 3.3 oz (10 cL) glass tubes. We’ve received numerous shipments of VineBox and we are always impressed with the quality of the wines they include in their program. The technology they use to rebottle the wines ensures the wine is not exposed to oxygen before being repackaged in the by-the-glass tubes. Summer Rosé Box contains 6 glasses of wine for $49. With a focus is on European wines, this tasting box includes Cabernet Sauvignon rosé from Spain, Italian rosé from the base of the Alps, French rosé from Provençe to the frozen tundras of Savoie. Love the idea of wine by the glass? VineBox offers a quarterly wine subscription of 9 tastes, too. If you love any of the wines, you can order full-sized (750 mL) bottles or more glasses. Read our VineBox Review to learn more. A Six-Pack of Rosé from Martha Stewart Wine Co. The Martha Stewart Wine Company offers affordable wines selected by Martha herself from a curated collection presented to her each month. They sell wine by the bottle, in six-packs, and as a subscription. They've got a great six-pack of rosés this season for $80.10, plus $9.95 for shipping. Prefer to get your rosé all year round? Pick your own wine — including rosé! 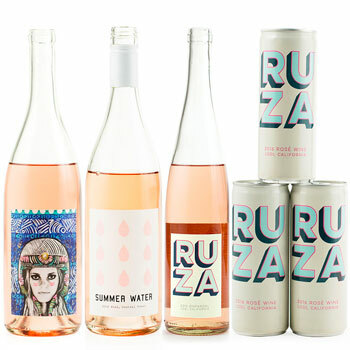 A few years ago when Winc started making their own wine, they set off on a mission to create a great rosé and they rather cleverly named it Summer Water. It sold out very quickly (because who doesn’t want to drink a wine called Summer Water) so the next year Winc increased their production and launched the Summer Water Societé — a fun way to describe Winc’s seasonal rosé wine subscription. We bet you’re not surprised to learn that sold out lightning quick, too! Aside from a clever brand name, Summer Water is a rosé made from a blend of different red wine grapes from the Central Coast wine region of California, mostly from Monterey and Santa Barbara County. The 2017 vintage are a blend of 85% Grenache and 15% Syrah and the juice was fermented in stainless steel. It is a dry, light-bodied rosé produced using the maceration method of rosé winemaking where the little bit of color comes from short contact with the grape skins. The grapes were harvested early to achieve a higher acidity — this is why these taste fresh and bright and go so well with lighter fare like salads, fish (especially sushi and ceviche), and shellfish. The prominent flavors in the 2017 Summer Water include grapefruit, strawberry, and white peach. Like all rosé, it’s best served cold. 12.5% alcohol by volume. This wine is Vegan-friendly (according to Winc). Want to try it? Join Winc’s wine club and put a bottle of 2017 Summer Water in your first box. Then chill it, taste it, and enjoy your Summer Water! P.S. Summer Water Societé is sold out for 2018. Please check back next year!